Story: Walt Disney Animation Studios, the studio behind "Tangled" presents "Frozen," a stunning big-screen comedy adventure. 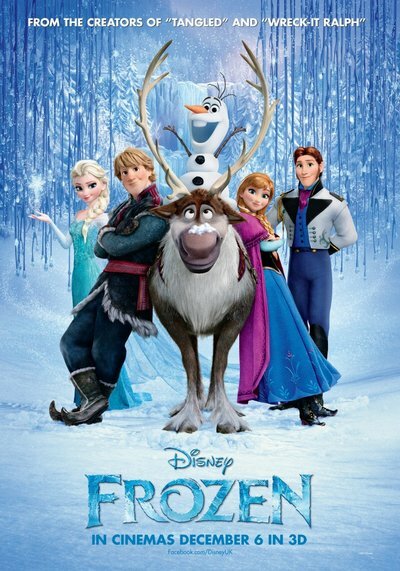 Fearless optimist Anna (voice of Kristen Bell) sets off on an epic journey - teaming up with rugged mountain man Kristoff (voice of Jonathan Groff) and his loyal reindeer Sven - to find her sister Elsa (voice of Idina Menzel), whose icy powers have trapped the kingdom of Arendelle in eternal winter. Encountering Everest-like conditions, mystical trolls and a hilarious snowman named Olaf (voice of Josh Gad), Anna and Kristoff battle the elements in a race to save the kingdom. The film features original songs from Tony winner Robert Lopez ("The Book of Mormon," "Avenue Q") and Kristen Anderson-Lopez.